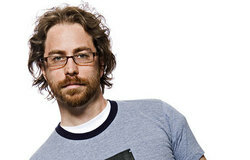 Jonathan Coulton grew up in Colchester CT, a town whose motto is "Where tradition meets tomorrow." He played snare drum in the high school marching band, which was fun, but did not attract any girls (even when he played his tender snare drum arrangement of "You've Got a Friend"). Jonathan switched to guitar and wrote a series of sweet and sad songs about being a teenager and having a vague feeling of overwhelming sadness and sweetness. This worked only marginally better. Jonathan studied music in college, and sang with an a cappella group called the Spizzwinks, and another one called the Whiffenpoofs. He spent a lot of time on stage in white tie and tails, showing his "jazz hands" only when absolutely necessary. Jonathan used to write software, but he quit the day job in order to pursue...other things...or something. He is the musical director for Little Gray Books created and hosted by friend John Hodgman, and he is the Contributing Troubadour for Popular Science Magazine (for whom he does a weekly interview podcast). Jonathan's most recent project was called Thing a Week, in which he produced a new song every week and released it for free as a podcast for an entire year. All of these songs are now available on four CDs in their original order (and state of completion), but you can also buy them from his online store, or from iTunes.